← Meet Brother William in the Scriptorium at Bradwell Abbey. Another Milestone. Another Namedoodle to be Won. And the winner is Number Six. You may remember, back in April, this blog reached 20000 visitors and Fernando’s name was drawn from those posted in the comments box. Thanks to all who entered. This might be another chance for you. Here we are, five months later, and about to reach 30000. Once again I shall ask, if you would like to win a Namedoodle of your own, to add your name in this comments box before the end of Sunday 30th September. The draw will take place the following day. The next milestone will be when we reach 50000. And the winner is Number Six, JoAnnB. Please let me know what you would like on your Namedoodle. Thanks everyone for joining in. We shall be doing this again soon I am sure. Many thanks to Richard Lees for picking the winning number. This entry was posted in Namedoodles and tagged calligraphy, Competition, Namedoodles, Winner. Bookmark the permalink. What a joy it would be to win your beautiful Namedoodle! Who knows? It might be your turn this time. Hi JoAnn. Congratulations you are the winner. Nancy…..you know who I am I hope Bill and I’d LOVE a Calligradoodle of my own from you. I have one from Glen Epstein…are you familiar with his work? May he RIP…he was one of my mentors…. Yes I am familiar with Glen Epstein’s work. I am sure I have posted videos of him somewhere here at Bill’s Space or on my YouTube channel. I shall look them up asap. 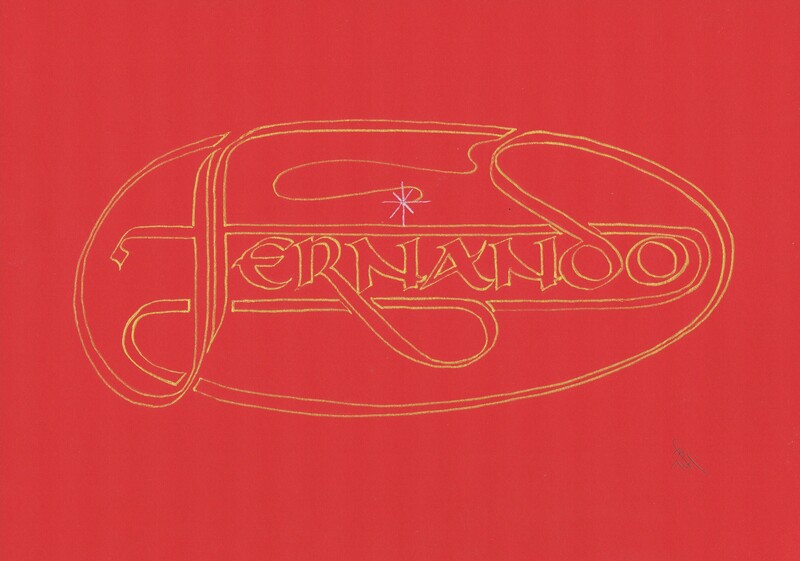 WOW…loved how you walked us through the Name Doodle process with Fernando’s name! I’d love to win one of your art works…throw me in with the rest of the deserving scribes please Bill! Thanks Nancy. I am glad you gained some benefit from Fernando’s doodle. I had alredy entered you so fingers crossed, You are Number5. the equipment that has come your way. May your friend’s Mum, obviously a scribe, Rest In Peace. You are entered in the draw. You are Number 4. I know I already have one, but you can never have too much Obi Bill work. Am still studying copperplate and I love it. Invested in some nibs as recommended by an American pointed nib expert, whose name escapes me at present. I am looking into doing a history qualification and wanting to do something around the Medieval period. Good luck with the pointy nibs and the Medieval history. I am glad you are enjoying Bill’s Space. Sorry, I have no plans to visit the US any time soon. You are in the draw. You are Number 2. What an honor it would be to win my name in your hand! Thanks for the opportunity.